The Lord has been so good to us, as we have been able to experience a little of the work of teaching pastors in Eastern Nepal. Representatives of 85 churches gathered in a very rural setting near Birtamode, in a building that had recently been completed for worship. The people were very gracious and appreciative, and received us well. If someone were to ask you how to preach, what would you say? That was just one of many soul-searching questions Brother Lowell Miller asked and answered from the pulpit. Our life is part of the message we are preaching. Kamal our translator, faithfully took English and delivered it into Nepalese. It has been a wonderful experience for Rochelle and myself, to see their faith, their zeal, and their love for the Lord. It appears that the government here is only partially patient with meetings like this, and the people do not know how long gatherings like this may be tolerated. Please pray for them. 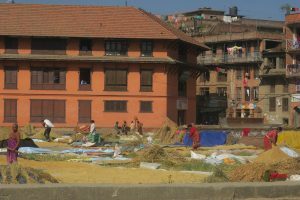 We flew to Kathmandu, and then took another flight on to Bhadrapur. Pastor Deepak received us there, and was a very kind host on our entire stay. Brother Merle and Sister Judy Flory were wonderful leaders and associates on this trip, and paved the way for every labor we were asked to participate in. Their interest in souls, and in reaching out to others, is felt in every heart they have touched. We give praise to God for their efforts in this part of the world. Where would you fit yourself in this description? Like the Great Harvest Jesus spoke of…some are observing, some are sitting, some are standing, and a few are working…and others are just going on with life as normal. Lu 10:2, Therefore said he unto them, The harvest truly is great, but the laborers are few: pray ye therefore the Lord of the harvest, that he would send forth laborers into his harvest. There are many gods that receive honor in this land. We rejoice to have been able to teach from the Bible about the true God; His love; His ways, and the promises that have been given to those who worship and serve Him. The people here seem to be greatly moved, both by the care and love that is being shown to them by MTM, and by the simple, yet deeper teachings that are being presented by those who come and minister to them. Please pray for the further opening of doors to the people of these lands. God is working here! CLICK HERE TO VIEW ENTIRE PHOTO ALBUM!! Editors note: The above article was written by MTM guest teacher, Brother Lowell Miller. Lowell and his wife Rochelle, live near New Paris, Ohio. Lowell gives pastoral leadership to their local congregation along with other leadership responsibilities. A big thank you to Lowell and Rochelle for serving the Lord so selflessly with MTM in Nepal. THANKS TO ALL OF YOU WHO GENEROUSLY SUPPORT THIS MINISTRY, BOTH IN PRAYER & FINANCES!! 1Co 3:7 So then neither is he that planteth any thing, neither he that watereth; but God that giveth the increase. 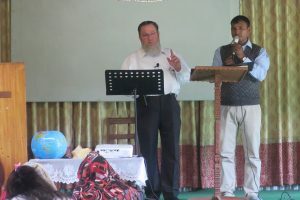 “We have no words enough to appreciate you and your team for whatever you did with your godly life and teaching in the conference that it was a huge blessing to our Nepali pastors and leaders”.